Plant geneticist Janet Braam and her colleagues at Rice University (Houston) showed 10 years ago that plants have genes that respond to touch. 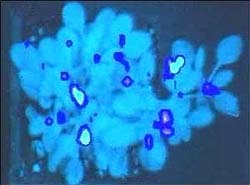 Now by incorporating the gene for fire fly luciferase into the touch sensitive genes, they can see those genes being induced in real time. Braam's earlier work showed that touching plants could affect their physiology. The figure shows two plants, the low bushy one on the left of the picture had been touched regularly, while the one on the right was not touched and grew much taller and more spindly. "It was rather serendipitous," recalls Braam. "We were looking at the effect on these genes which were turning on when we applied a hormone. Then we realized that it wasn't the hormone, it was the application of the hormone. It was the act of touching the plant that was turning the genes on." Braam has identified five genes in all in Arabidopsis thaliana that respond to touch. In the early stages of her research, she would sacrifice the plants to see if the genes had switched on, but now with the introduction of the luciferase gene, when the plants are touched, they glow. Using ultra-sensitive camerasthe plants put out in the order of nanowatts of lightBraam is able to detect the genes after 20 minutes at the point of touch. The signal then propagates throughout the plant, turning on the genes elsewhere. The effect lasts roughly an hour. "It makes sense that plants should respond to touch," says Braam. "Plants can't move, so they have evolved ways of acclimatizing to a particular environment. If a plant's growing in a windy place it has more chance of surviving if it's short and stocky, rather than long and spindly". Braam plans to use a different reporter gene that will allow her to look in more detail at the chemical pathways that propagate the signal from the moment it is touched. For more information: Janet Braam, Department of Biochemistry and Cell Biology, Rice University, Houston, TX 77251-1892. Email: braam@bioc.rice.edu.